It’s never been easier to invest your money. Apps, online brokerages, automated services, broker-dealer advisors, robo-investors, employer-backed retirement accounts and good old-fashioned banks are all here to help. The reality is that today anyone can be an investor. But with so many places and ways to invest, how do you stay on top of your portfolio? After all, you should conduct an investment portfolio check-up at regular intervals – either monthly, quarterly, or yearly, depending on your investment strategy and ability to control your emotional response to your portfolio performance. An investment spreadsheet is one of the simplest, most versatile ways to track and understand the performance of your financial portfolio. Here are 3 reasons why an investment spreadsheet is such a useful way to track your portfolio. And to get you started, here’s a post with a free example investment spreadsheet. 1. An investment spreadsheet puts all your investment information in one place. If you have investments with several different companies, such as online brokerage firms, an investment manager, 401(k)s from a different job, and college savings funds, it becomes very time-consuming to track each investment individually. Using a spreadsheet allows you to look at one document to get an overall picture of the health of your entire investment portfolio. 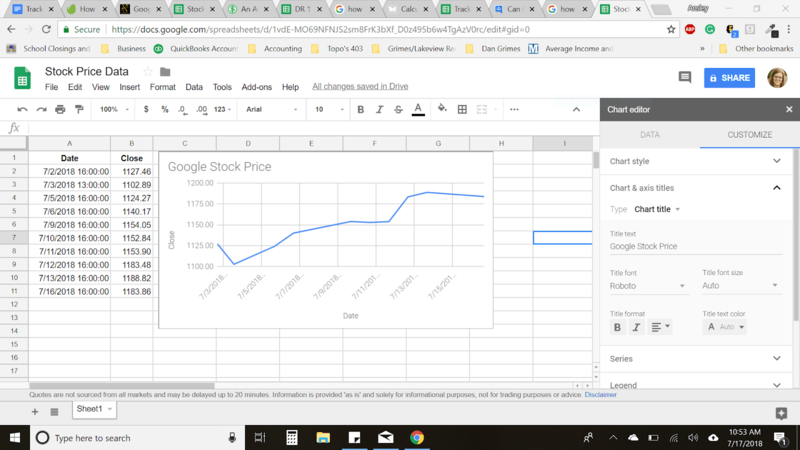 Google Sheets will pull in data from Google Finance so you can see your performance in (almost) real-time. (Google Finance data may be delayed by up to 20 minutes.) You can generate a wide range of data regarding the performance of a US stock or mutual fund by using the formula =GOOGLEFINANCE(“symbol”,“attribute”), where the “symbol” is the stock ticker and the “attribute” is the specific data you wish to know. For a list of attributes and information on proper syntax, check out Google’s help document. Note that this formula only works for securities, so you cannot use it to display bond data. If you do invest in bonds, you can use this calculator to figure out the bond’s value at maturity. will return a chart displaying the daily Google stock prices between the two dates. Note that the correct syntax for the date attribute is DATE(YEAR,MONTH,DAY). You can easily turn this data into a chart for a visual representation of price change over time. Select the data you want to see in the chart, such as the date and closing price. From the menu, choose “Insert” and “Chart.” A sidebar will appear on the right side of your screen so you can customize the type of chart and the layout of the information displayed. Using these concepts, you can create a spreadsheet of your entire portfolio and its performance over the desired timeframe. 2. With an investment spreadsheet, you can easily gauge your portfolio’s performance against benchmarks. Using a benchmark is a great way to evaluate the performance of your portfolio. If the benchmark is increasing for several months or years, but your portfolio is flat or decreasing, you may wish to reconsider your portfolio mix. Depending on the types of investments in your portfolio, there are several popular benchmarks you can use. The benchmarks create an index based on various information regarding the stock mix within the benchmark itself, so they are well-rounded representations of the industry upon which they focus. The Dow Jones Industrial Average indexes the performance of 30 of the largest, most well-known, publicly traded companies in the US. The Dow is especially helpful if you invest in one of the 30 companies listed. The S&P 500 Index indexes the performance of 500 large US companies. The Russell 2000 indexes the performance of 2000 small US companies. The Dow Jones Wilshire 5000 indexes the performance of over 5000 companies of various sizes and in various industries. Lipper Fund Indices are a group of indices tracking the performance of different types of mutual funds. It’s helpful to know how your portfolio is faring against an index with a similar make-up. If you primarily invest in large US companies, the Dow and the S&P 500 are helpful; if however, you prefer to invest in small-company stocks, the Russell 2000 is a better benchmark. The Dow Jones Wilshire 5000 will give you a good mix of different types of companies. When using a graph to compare your portfolio’s performance to that of a benchmark, it’s important to note that index values are typically much higher than individual stock values. The result is a graph that has relatively straight lines, which isn’t particularly helpful. 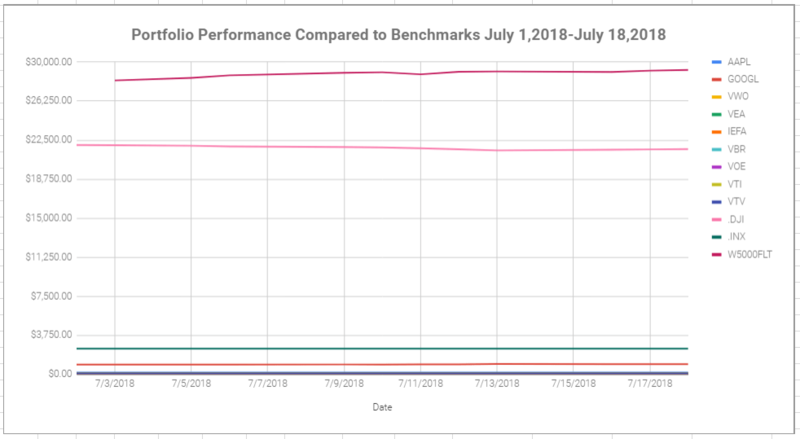 By playing with the benchmarks you use as well as the gridline values and the values of the y-axis, you will be able to see more detail in the trend lines. Regardless of the performance of your portfolio, it’s important to keep a healthy perspective. The market will go up and down. Constantly monitoring your portfolio can quickly build fear in times of recession and a false sense of security during times of growth. You should decide ahead of time if you’re a short-term or long-term investor. Long-term investors shouldn’t obsess over small changes; in fact, for the sake of your psychology, it might be best to check in with your portfolio only quarterly or yearly. 3. Using an investment spreadsheet allows you to easily evaluate your asset allocation against your investment strategy. Asset allocation is the unique makeup of your portfolio. The asset allocation you choose depends largely on the purpose of your investing. Are you looking to make money to fund a vacation within the next year? If so, you might want to invest in a more liquid asset, such as a CD or a savings account. Are you saving for your child’s college education in 15 years, or are you preparing for retirement in 30 years? In that case, you’re probably more interested in a long-term investment with more growth potential. Whatever the case, the purpose of your investment will inform the aggressiveness of your target asset allocation. If you need help deciding which allocation is right for you, read this helpful guide from Vanguard. Once you know your target asset allocation, you can use your investment spreadsheet to compare your actual allocation against your desired allocation to make more informed investing decisions. 1. Create a master sheet of your various investments. You’ll need to know the ticker, price, and number of shares owned to figure out the value of each holding. 2. Use the formula =GOOGLEFINANCE(“ticker”) to display the current price of each security. 3. Multiply the price of the security by the number of shares you own to figure out the value of your holdings. Create categories to classify your investments. The example uses stock and cash. 6. 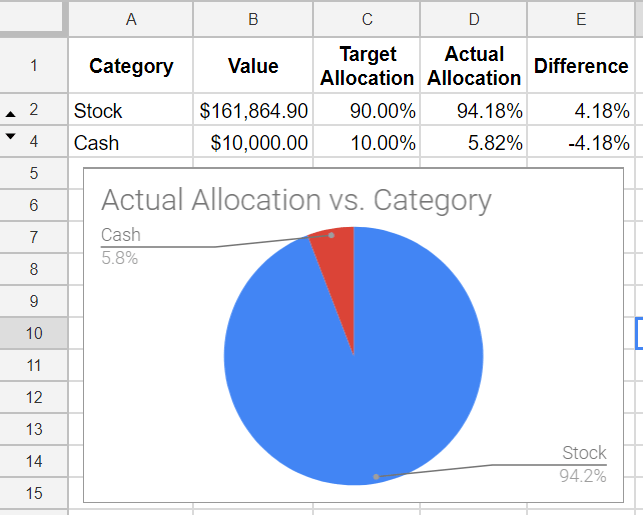 Compare your actual allocation to your target allocation. 7. If you wish, you can create a pie chart for a visual representation of your unique allocation using the steps outlined earlier in this article. Your asset allocation is a measure of the risk inherent in your portfolio. If your actual allocation is different from your target allocation, you may choose to sell off some of your assets to invest in a different investment category, or you may decide to invest as-of-yet uninvested assets to adjust your allocation. Overseeing your portfolio with an investment spreadsheet reduces the time needed to check your investments through brokerage portals, statements, apps, and websites, allowing you to spend more time actually evaluating your portfolio’s performance. With the use of graphs and charts, you can gain insight into your performance against common benchmarks as well as your portfolio’s allocation as compared to your target asset allocation. Using a spreadsheet is a free, simple, and flexible way to evaluate whether you’re on the right track toward achieving your investment goals.